Mid-winter is the time to be thinking of marmalade. If nothing else it’ll take your mind off that other old rubbish that happens towards the end of December. 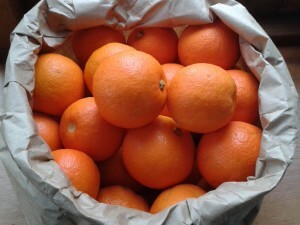 Seville oranges are in season from December to February so you’ve plenty of time to be thinking about it. If you have some indifferent honey you’d like to use up, here’s a good target – oranges and honey together develop a superb depth of flavour.